With a few small twists of history, battleships built for France’s Marine Nationale or the Imperial Russian Navy might have served under British or German colors instead. Repaired and refitted, these ships could have sharply altered the balance of power in the North Sea. 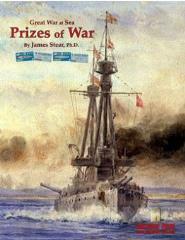 Prizes of War is a supplement for Great War at Sea: Jutland that allows players to examine these questions of alternate history. French and Russian ships are allocated to the British and German fleets, and included in 12 battle and 11 operational scenarios set in and around the North Sea. The Admiralty briefly entertained a French proposal to sell the five incomplete hulls of the Normandie class; had they been purchased, they would have been re-worked to carry the British 15-inch Mark I naval rifle. Prizes of War includes that alternative design. In August 1914, First Lord of the Admiralty Winston Churchill justified the seizure of the just-completed Turkish battleships Sultan Osman I and Reshadieh by claiming that the Turks might steam across the North Sea and deliver them to Germany. So we have those two ships in German colors. Prizes of War includes 80 silky-smooth, die-cut-and-mounted playing pieces: 60 “long” ship pieces and 20 standard-sized ones. Players will need the Great War at Sea: Jutland game in order to enjoy all of the scenarios.